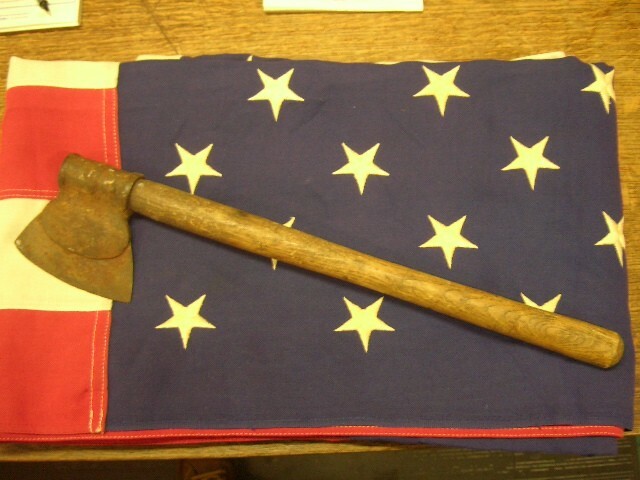 Here is a 19th Century Axe used by a white man to cut tobacco and taken by Indians becoming one of their weapons. Blade has been worn down atleast 4 inches. Measures approx. 4"inches X 4"inches handle not original is my opinion. Here is a 19th Century Axe used by a white man to cut tobacco and taken by Indians becoming one of their weapons. Blade has been worn down atleast 4 inches. Measures approx. 4"inches X 4"inches handle not original is my opinion. Please email cowboycabin@centurytel.net with questions or call 406 270-2842.